US senators have failed to unlock a short-term spending bill which was set to keep the government open through February 16. Senate Democrats refused to support the bill, pushing for a deal on the Obama-era DACA (Deferred Action for Childhood Arrivals) program in order to protect illegal migrants who were brought to the US as children. 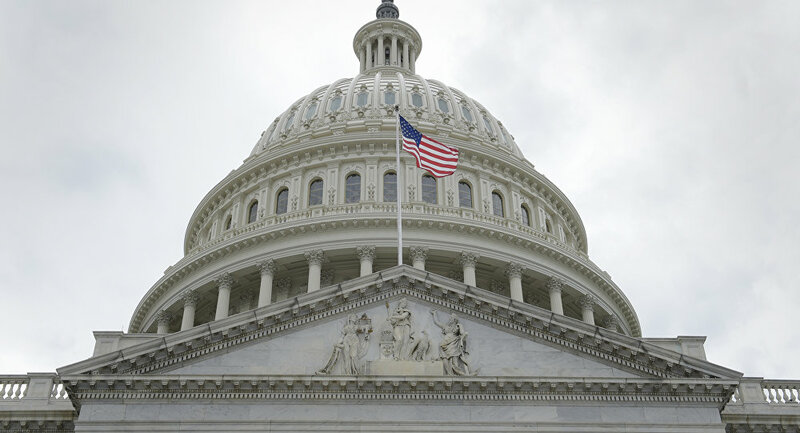 The US government shut down on Saturday after senators failed to pass a stopgap motion before the midnight deadline. Funding has ceased for many federal agencies, except for the military and other essential services, furloughing hundreds of thousands of staffers. This is the first shutdown since 2013. President Donald Trump slammed the Democrats, saying that "they could have easily made a deal but decided to play Shutdown politics instead" and calling them "obstructionist losers, not legislators." Sputnik has recalled the last five US federal government shutdowns. The previous shutdown occurred during the presidency of Barack Obama on October 1-16, 2013. Congress failed to reach an agreement on a budget for the 2014 fiscal year after the Republican-led House of Representatives began pushing to delay or defund the Patient Protection and Affordable Care Act (commonly referred to as Obamacare). In response, the Democratic-led Senate and the Obama administration rejected the proposals, which resulted into a budget impasse threatening mass disruption. During the shutdown, some 800,000 federal employees were furloughed and another 1.3 million had their paychecks delayed. The shutdown ended on October 17. The debt limit was suspended until February 7, 2014. The 2013 shutdown cost the country $24 billion, according to estimates by S&P. The two US federal government shutdowns of 1995-1996, which lasted a total of 27 days, stemmed from a conflict between Democratic President Bill Clinton and the Republican Congress over funding for Medicare, education, environmental policies and healthcare in the 1996 federal budget. After Clinton vetoed the spending bill sent to him by Congress, the federal government suspended non-essential services from November 14 through November 19, 1995. During the first shutdown, about 800,000 federal employees were furloughed. The second shutdown occurred during December 16, 1995 to January 6, 1996. It caused some 284,000 workers to be furloughed. The 1995-1996 shutdowns cost the US economy $1.4 billion, according to the Congressional Research Service. In 1990, the federal government curtailed its agency activities and services during October 6-8. The shutdown was the result of a deficit reduction plan negotiated by President George H.W. Bush with Congressional leaders. In particular, the plan included tax increases, which contradicted Bush’s "no new taxes" campaign pledge. The new taxes were opposed by conservative Republicans. Congress passed a continuing resolution, but it was vetoed by Bush, causing a three-day shutdown over Columbus Day weekend. Since the shutdown occurred over a weekend, it did not have serious effects. Around 2,800 federal employees were furloughed and the economy lost some $2.6 million. The 1986 federal government shutdown was the last in a series of shutdowns which occurred during Ronald Reagan’s presidency. On October 17, the government furloughed some 500,000 workers because Congress failed to pass a spending bill. The shutdown lasted half a day and the cost was estimated at $62 million. On October 4, 1984, nearly 500,000 government employees were sent home at midday because Congress failed to approve a stopgap spending bill. The shutdown occurred after the Reagan administration opposed the inclusion of a number of projects in the bill. The furlough lasted half a day and the back payments for the furlough were estimated at $65 million.